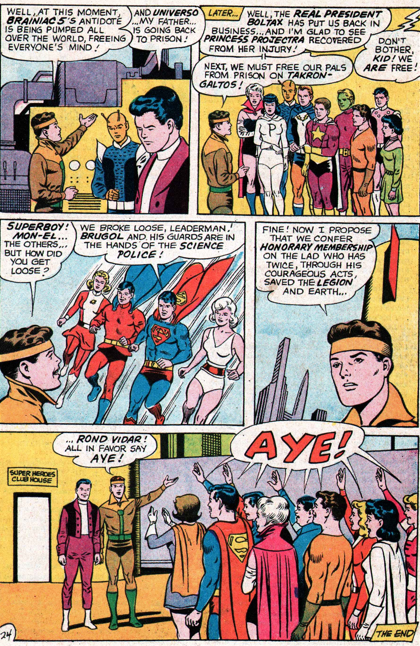 A birthday party for Brainiac 5 turns into a deadly event in Adventure 378 (March 1969), but gives Karate Kid his most notable achievement during Jim Shooter’s tenure on the Legion. Superboy, Duo Damsel, Karate Kid and Princess Projectra are the guests at Brainiac 5’s birthday. Apparently the other 20 members of the Legion simply don’t like him? At any rate, those who don’t attend are the lucky ones, as Brainy and his guests all get poisoned. They have only 24 hours to live. 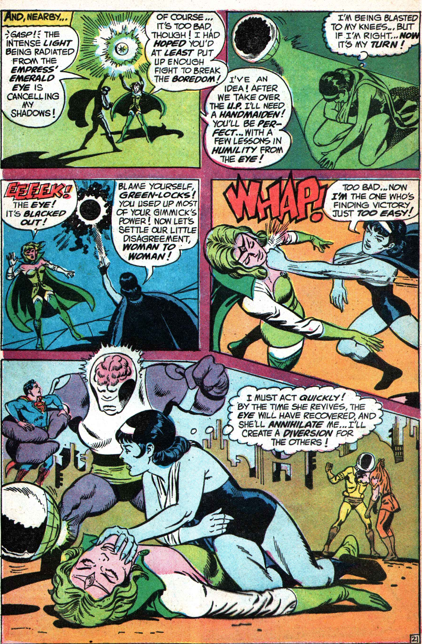 While Brainiac 5 desperately hunts for a cure, Luornu goes to spend her time with her parents, Sueprboy flies off to do as many good deeds as possible, Projectra hangs in a park and feeds birds, and Karate Kid decides to die in battle, and seeks out the Fatal Five. He plunges into an attack, and defeats the entire group single-handed! The five gather together as their deadline approaches. 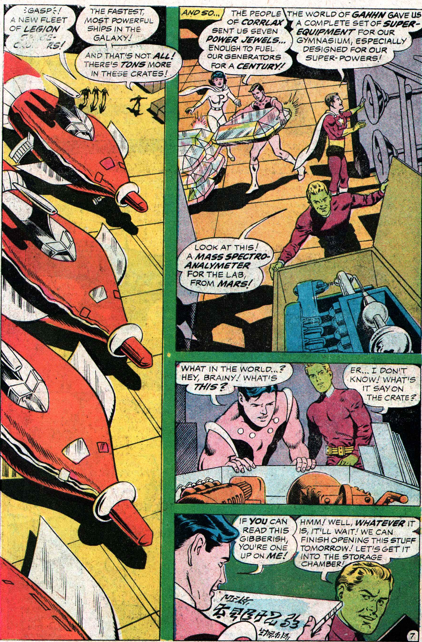 At the last minute, Brainiac 5 remembers the Miracle Machine, but collapses on the way there. A mysterious man enters to gloat, and then time freezes. WTF? This off-beat tale by Jim Shooter is the first to really make use of Chemical King, a sadly underused character, whose powers were much greater than most people understood. 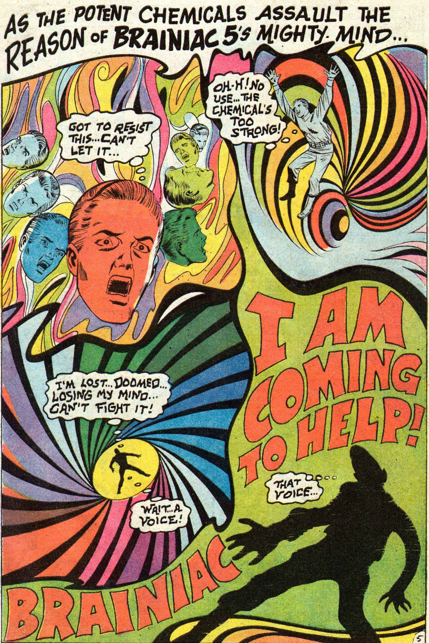 Adventure 377 (Feb 69) also has one good page of psychedelic 60s art. 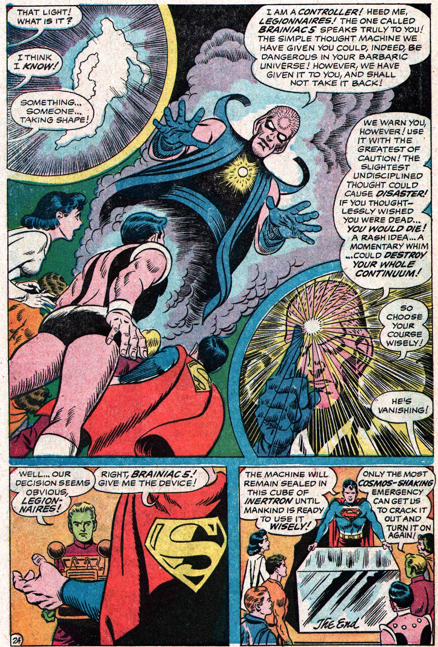 Brainiac 5 goes all hallucinatory after a chemical attack by thieves from the planet Modo, operating under the aegis of the crime lord Modulus. But rather than take him on, the story goes in a curious direction, as the Legion start charging people for their assistance. 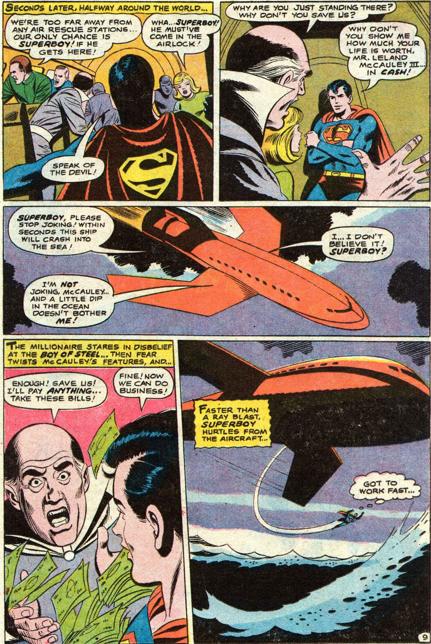 Leland McCauley makes his second appearance, with Superboy charging for rescuing him from a crashing spaceship. This is the last appearance of the character until the 80s. 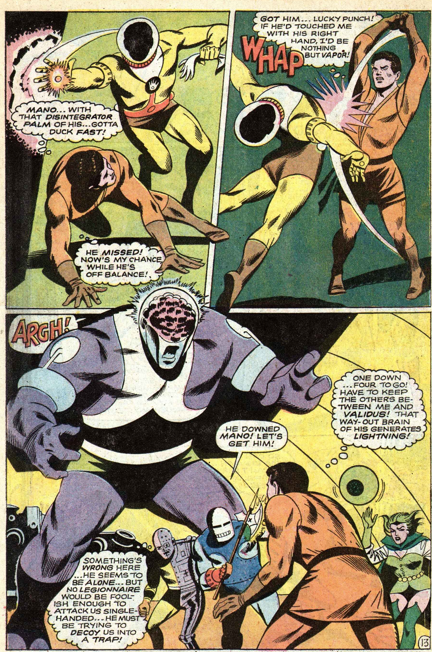 The purpose behind the acquisition of money was two-fold; to make the Legion an attractive target for Modulus to rob, and also to gather a variety of currencies, of different materials, that Chemical King could use his powers of speeding up (or slowing down) chemical reactions on. He causes a chain reaction among the currencies that turns them into a paralyzing gas, which takes out the criminals on Modo. The story does point out that the Legion confiscate the loot they find on Modo, and use it to reimburse those they had charged. With better art, this could have been a memorable tale. 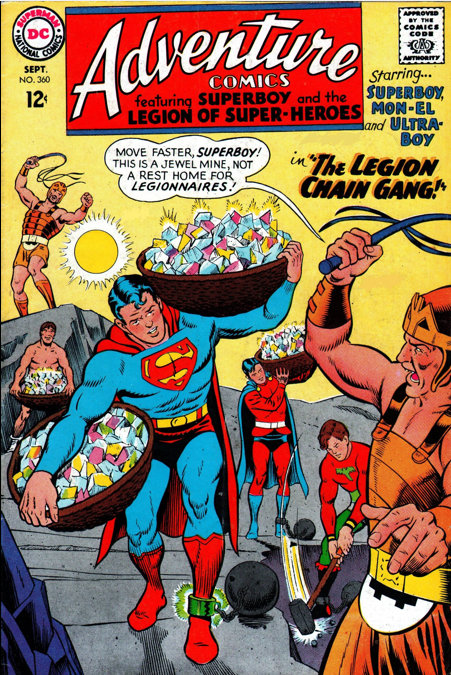 After the embarrassingly sexist “Revolt of the Girl Legionnaires” a few years ago, one could be sure that this version, by Jim Shooter and Curt Swan, would be much better, right? After all, this is May of 1968. But nope, Adventure 368 is just as bad as the earlier version. Thora, an ambassador from the matriarchal world of Taltar comes to Earth, supposedly to meet with Kandro Boltax but really to increase the powers of the female Legionnaires, and get them to turn against their male teammates. At first the power increase seems to just be a plus all around. 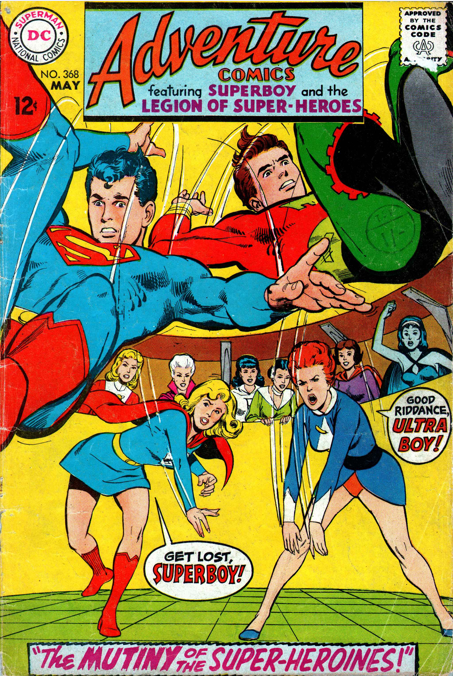 Duo Damsel can make hundreds of bodies, Shrinking Violet can grow or shrink, Phantom Girl can make others intangible, Supergirl is immune to kryptonite, and so on. 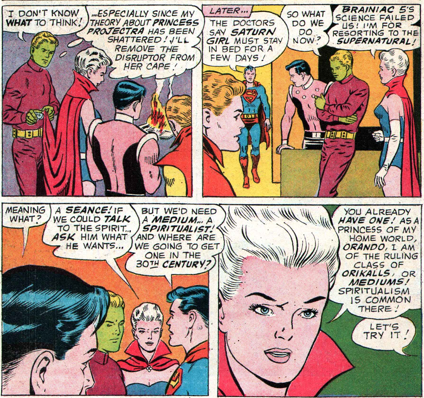 Brainiac 5 is suspicious of the situation, and acting on his advice, Invisible Kid orders the women quarantined. They take that as jealousy, and, fanned by the effect of Thora’s power charge, rebel and battle the boys. 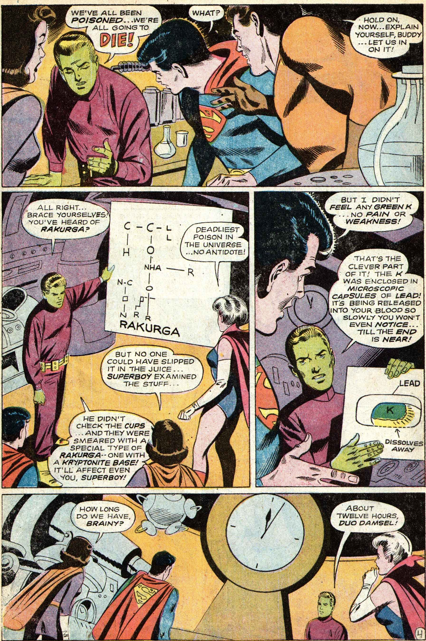 There has been no element of the romances on the team through much of this story, but when Shadow Lass starts expressing her disdain for Brainiac 5, whom she feels rejected her, Supergirl’s love for him causes the “spell” on her to break. 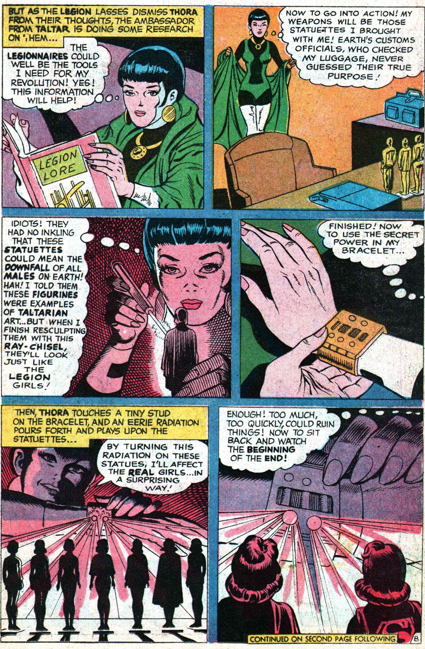 She figures out that Thora is behind it, and causes her bracelet, the source of the power charge, to break. Thora kills herself, and we hear that the matriarchy on her planet has been overthrown, and men returned to their rightful place of dominance. OK, just as bad as before. 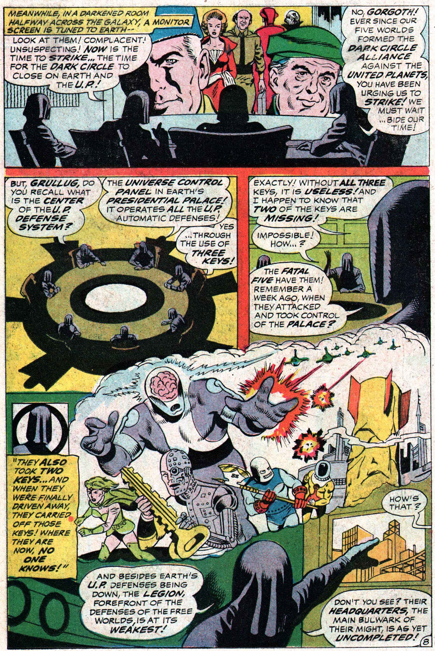 A new headquarters, a new enemy and a mysterious machine in the Jim Shooter/Curt Swan tale in Adventure 367 (April 1968). The Legion are constructing a new headquarters after their battle with the Fatal Five, and the story spends a lot of time showing us the new facilities. They also receive many gifts from around the galaxy. They assault Tokyo while Karate Kid is there, meeting with his Sensei. At this point, all we learn of the man is that he trained Karate Kid, but he will return in the 70s, and his story expanded. 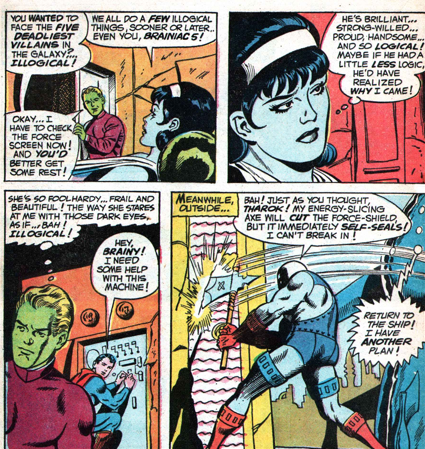 When the Dark Circle’s forces attack the headquarters, Brainiac 5 wishes silently that Karate Kid was there to help defend them, and then abruptly, Val is there. 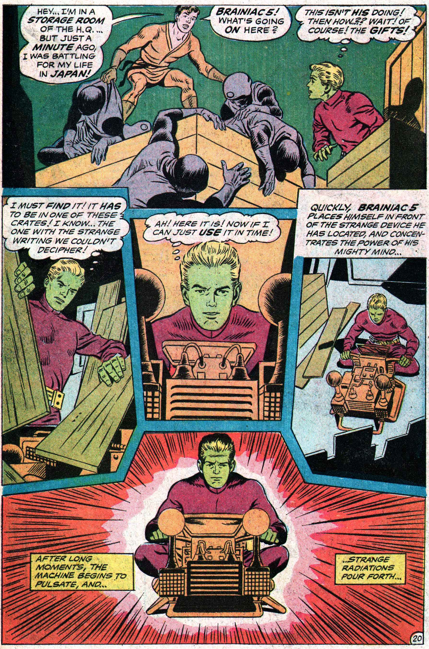 Brainiac 5 correctly theorizes a mysterious present is the cause, and uses the device, the Miracle Machine, to repel the invasion and complete the new headquarters. 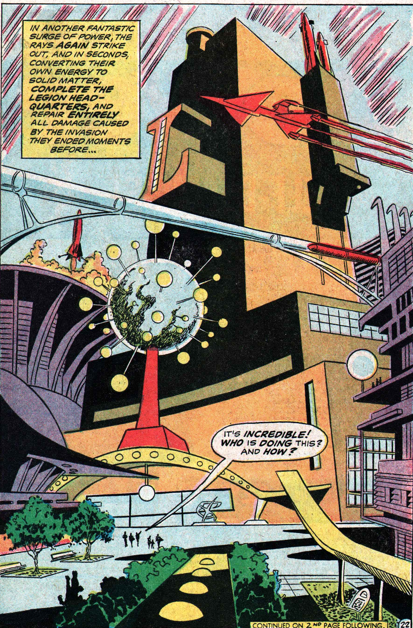 Every Dark Circle operative on Earth is shot off into space, and Curt Swan creates a 60s sci-fi masterpiece in the new hq, which would last until the rebuild in the 80s. One of the Controllers appears, explaining that the Miracle Machine was a present from them – although at the same time warning them that it can make any thought into reality, and a stray wish could obliterate the universe. Christmas must be a riot with the Controllers. 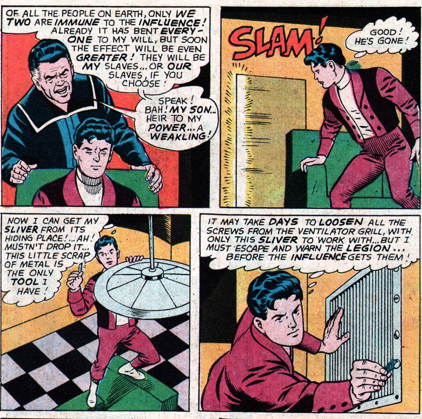 The Legion seal the Miracle Machine in a cube of inertron, where it stays for many years, though even encased it appears again in the early 70s. The Controllers do not appear again until the late 70s. 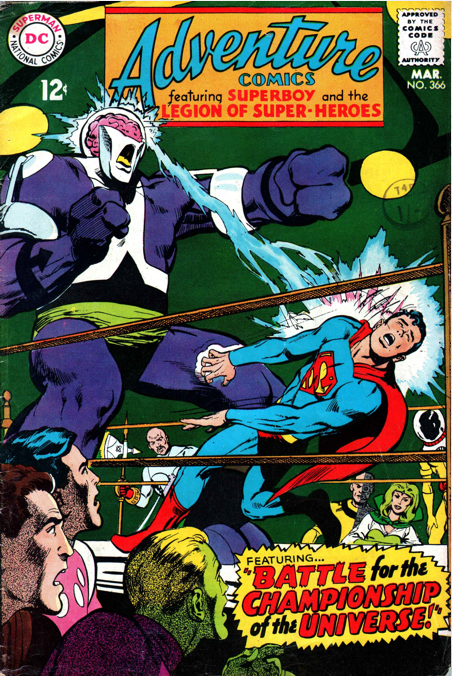 A great second half to the return of the Fatal Five in Adventure 366 (March 1968), though at no point do Superboy and Validus face off in a boxing ring, despite the cover. While Cosmic Boy, Superboy, Brainiac 5, Shadow Lass and Karate Kid manage to avoid the Talokian army until the find and destroy the machine controlling their minds, the Fatal Five run rampant on Earth, capturing Metropolis. I suppose I should have said four Legionnaires, as Shadow Lass is not a member at this point. Brainiac 5 wonders why she has chosen to accompany them, and we discover that Shadow Lass has fallen for him. And its enough of a crush that she is willing to abandon her home and put herself in deadly danger for it. Still, Brainiac 5 dismisses this possibility as “illogical.” He likes using this word a lot in stories from this time, probably because Spock uses it on Star Trek, which was on television at this point. Besieged by the Fatal Five, Shadow Lass asks to join the team, making her the first member sworn in in the midst of battle. And she proves herself quite a capable member, taking out the Emerald Empress despite her broken arm. The 5 teammates battle the Fatal Five to a draw, but when the U.P. army arrives the Fatal Five flee. The Fatal Five return again a few months down the road. 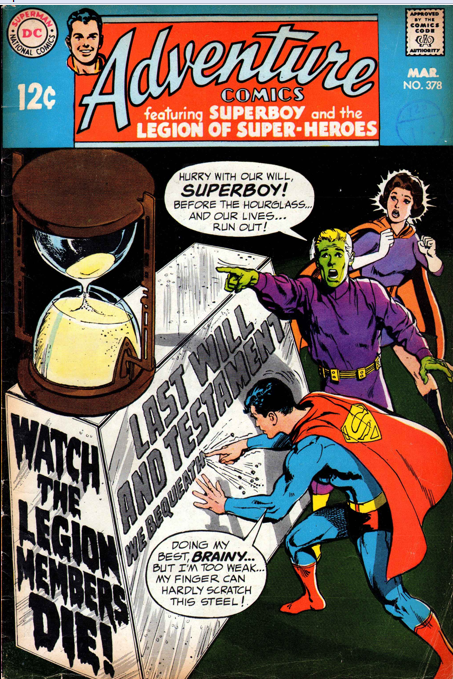 Adventure 360 (Sept 67) cuts between the Legionnaires imprisoned on Takron-Galtos, those running a resistance movement on Earth, and a mysterious villain whose identity is subtly hinted at, but not revealed until the conclusion of Jim Shooter and Curt Swan’s tale. After checking to see that Superboy, Mon-El and Ultra Boy are still safely imprisoned, Kandro Boltax goes to check on his very immobile and unemotional son. Really perceptive readers might be able to identify this lad, but this scene is about as close as the story gets to giving away the identity of the mastermind of the plot. 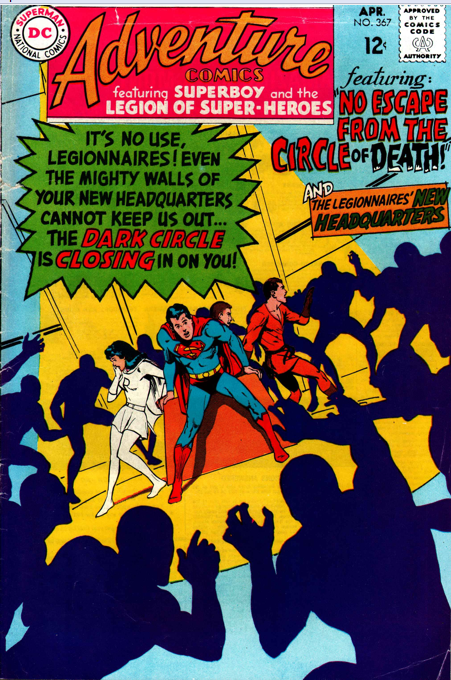 Invisible Kid leads a breakout of the Legionnaires imprisoned on Earth, bringing them to an underground lair of Lex Luthor’s. Though some of the team want to lead a breakout of those on Takron-Galtos, Invisible Kid insists they solve the situation on Earth first. Duo Damsel gets to put her powers to use, infiltrating Kandro Boltax’s office and discovering secret info on the water purification plant (remember that? ), which has been used to chemically control the minds of people on Earth. Brainiac 5 devises an antidote, and Invisible Kid’s team leads an assault on the water plant, while the imprisoned Legionnaires manage to break out on their own. Everyone comes together as Boltax is revealed to be Universo in disguise, and the son, who managed to get the cure into the water, is, of course Rond Vidar, who is granted honourary membership at the end of the story. Despite Universo not appearing, except in disguise, for the bulk of this 2-parter it works very well. 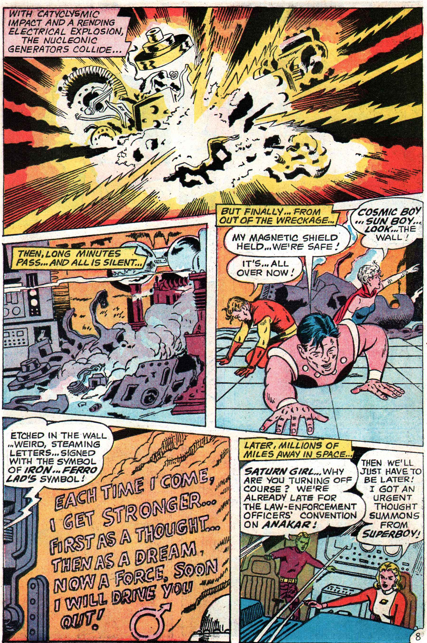 The story would heavily influence an 80s Legion tale, The Universo Project – in fact it would be the very similarities that would alert the Legion members to Universo’s actions in that tale. 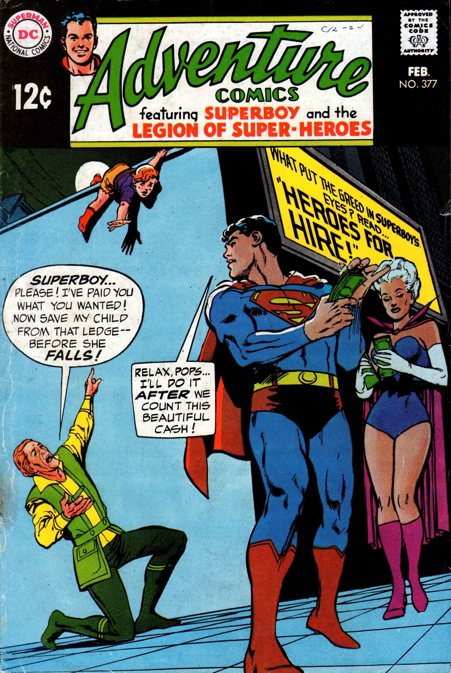 Adventure 357 (June 1967) has a pretty decent mystery story by Jim Shooter, with Curt Swan art. It manages to play both sides, with a phony ghost and a real one. 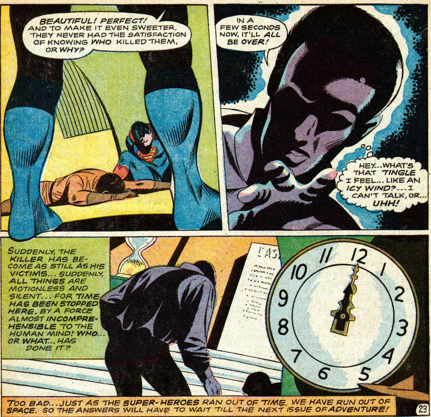 The Legionnaires are feeling guilty over Ferro Lad`s death, many of them having bad dreams. And then deadly accidents begin to occur, with ghostly messages left behind. They decide the Clubhouse must be haunted, and Princess Projectra holds a seance to try to contact his ghost. 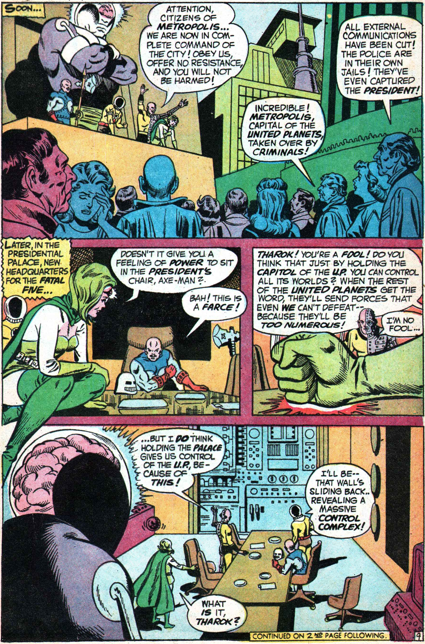 Brainiac 5 is not at all impressed with her oracular background, the first tension between him and a magic user on the team. 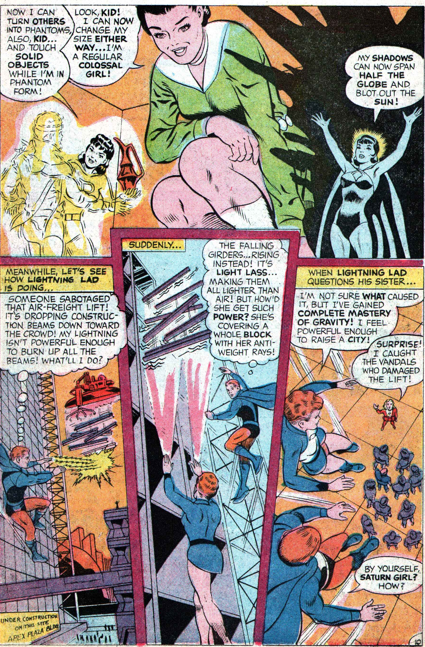 She manages to contact Ferro Lad`s ghost, who insists that he wants vengeance against the four members who `let him die,`and demands that the Legion disband. 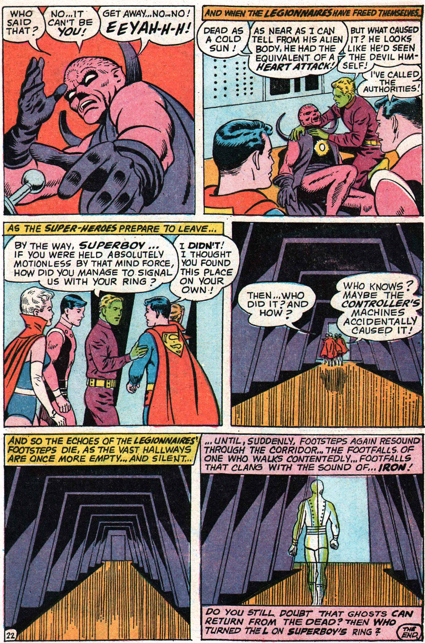 Brainiac 5 orders this to happen, and they go their separate ways, but almost immediately after Superboy is snatched by a Controller. 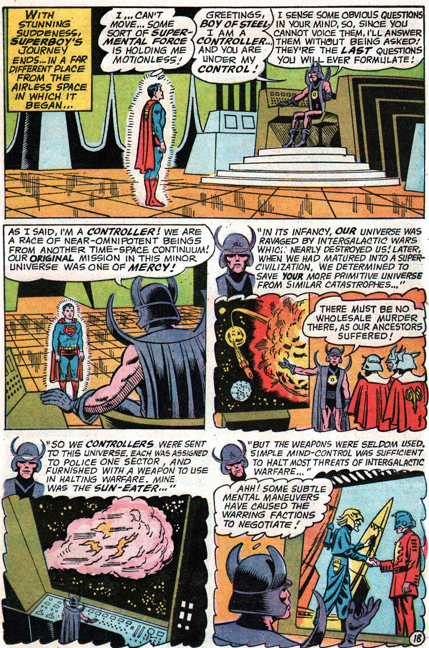 This is the first time the Controllers appear in any DC book. 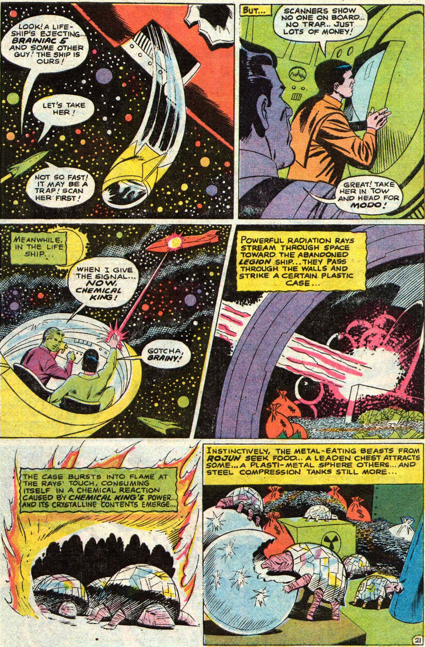 There is as yet no backstory linking them to the Guardians of the Universe, but we do learn that the one in the tale was responsible for the creation of the Sun-Eater, which he planned to use for conquest. 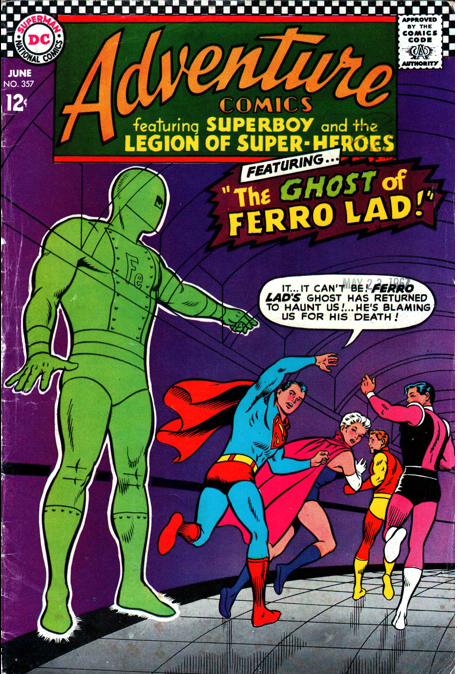 It is the Controller who created the ghost of Ferro Lad, and wants revenge on the Legion. 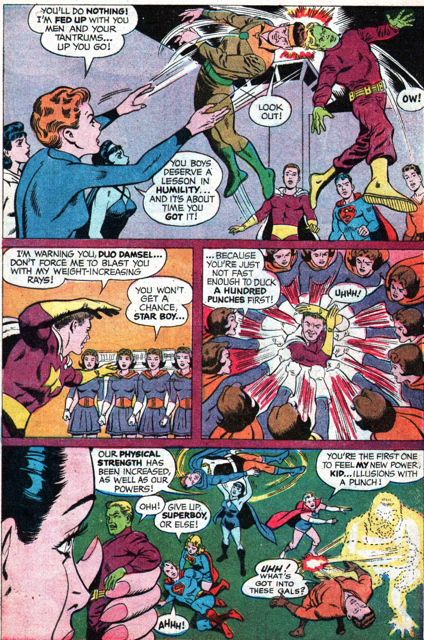 Superboy`s flight ring gets activated by a mysterious force, which summons the rest of the team, who free Superboy, while the same force, revealed as the true ghost of Ferro Lad, takes down the Controller. Nicely done for a dead guy. 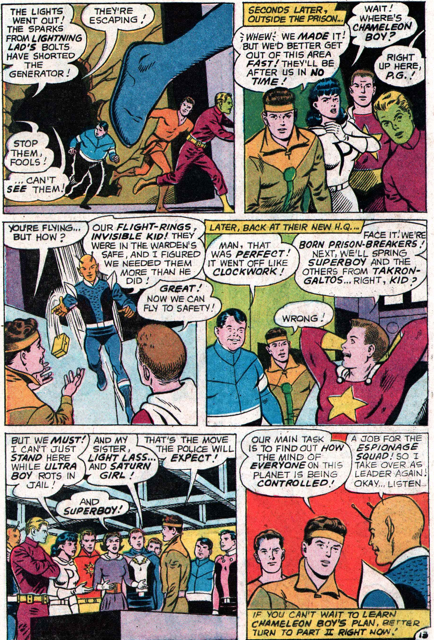 This story also features a brief appearance by Cosmic Boy`s younger brother and future Legionnaire, Pol Krinn.